director of old-master paintings for Sotheby's worldwide. "premier auction house for fine art"
a spiritual narrative portraying the allegorical stages in the soul's progress. $17.5 million rather than attempting to keep the collection together. To break up the suite is, to say the least, unconscionable. director of old-master paintings for Sotheby's worldwide. "Since one of them is at Yale, it makes the most sense to do it this way," he said of his decision to auction them one by one. The same rational is offered by art dealer Libby Howie, who owns the lot. To hell with purpose or intent, to hell with scholarship! We still hope somehow there will be a way to keep the suite together. Perhaps the Center for British Art or some Yale alumni will come forth. At the onset, the Tate Britain was interested but found it unaffordable. article by the Times' Carol Vogel for a detailed timeline of this story. click on the 1st illustration below, the title page. But what a surprise to seller, London dealer Libby Howie who got her right deserves! $7.7 million got an even paltrier $7.1 million!!! SHE SURE GOT HER "COME-UPPANCE" ! Scroll down or click on image below for full NYTimes coaverage. 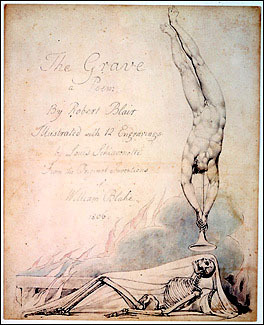 In 1805, William Blake, the poet and artist, was hired to engrave a series of 20 of his own watercolor illustrations for Robert Blair's poem, "The Grave." This was an important opportunity for Blake. "What is Good must Succeed first or last," he wrote to a friend. Blake has indeed succeeded — he looms large in our understanding of the artist's imagination — but the commission for "The Grave" was doomed. The publisher hired another engraver in Blake's place. The original watercolors more or less vanished until 2001, when 19 were discovered as a group in a Glasgow bookshop. A tangled tale ensued. And now for the unhappy final chapter. They are to be broken up and auctioned at Sotheby's. The history of collecting is littered with the leaves of books and manuscripts that have been taken apart and sold page by page. It is almost always a practice with only one justification—maximizing profit. To literary scholars and art historians, it is maddening, if only because it scatters the elements of a coherent collection or a complete book. The loss, in the case of these watercolors, is exacerbated by the very nature of Blake's art. He has come to exemplify the coherence of a fierce, prophetic vision. His watercolors for Blair's poem illustrate allegorical stages in the soul's progress — in other words, a spiritual narrative. To sell the watercolors one by one is, at the very least, to misconstrue Blake's art. The present owner of the watercolors, a London art dealer named Libby Howie, purchased them in 2002 on behalf of a group of investors. 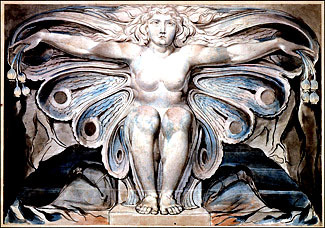 She has argued that since one of Blake's paintings for "The Grave" now belongs to Yale University, there is no reason to keep the rest together. That is nonsense. This is an auction that should not take place. It may mean allowing more time for a museum or library to raise the funds to purchase these watercolors. It may mean a reduction in Ms. Howie's price. But these watercolors belong together. "The Gambols of Ghosts According with their Affections Previous to the Final Judgment"
"Whilst, surfeited upon thy Damask Cheek, the high fed Worm in lazy Volumes roll'd, riots unscar'd"
"Our time is Fix'd, and all our are Number'd' "
"The Meeting of the Family in Heaven"
The discovery was pure serendipity: nosing around in a dusty bookshop in Scotland on a spring day five years ago, a pair of British booksellers stumbled upon a weathered red leather case engraved with the words "Designs for Blair's Grave." Opening it, they found 19 Romantic yet macabre watercolors — depicting angels, sarcophagi, moonlit graveyards, arm-linked spirits — rendered in a subtle range of grays, black and pastels. Five years, one lawsuit and an export battle later, the watercolors — illustrations created in 1805 by the poet and artist William Blake for a 1743 poem — are being heralded by scholars as the most important Blake discovery in a century. Yet to the consternation of many experts, all 19 are headed for auction this spring at Sotheby's in New York, which plans to break up the set and sell them on May 2 for a projected $12 million to $17.5 million. Estimated prices of the watercolors, each mounted on a 13-by-10-inch backing, range from $180,000 to $260,000 for the inscribed title page to $1 million to $1.5 million for the most intricate and compelling scenes. That the works may end up scattered is a bitter prospect for Tate Britain, one of the world's most important repositories of Blake's works. Aided by a temporary export ban, the museum tried but failed to raise the money to buy them. "That a group of works that have remained together for 200 years should be split up for financial reasons means that any opportunity for scholars to see them has evaporated," said Sir Nicholas Serota, the Tate's director. 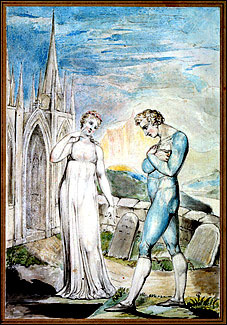 Sotheby's counters that the set is incomplete anyway because one of the 20 watercolors that Blake originally produced for the poem, "The Grave," by the Scottish writer Robert Blair, was mysteriously separated from the rest. That work, "The Widow Embracing Her Husband's Grave," is owned by the Yale Center for British Art, which received it as a gift from its founder, Paul Mellon. "It's not complete, so in a sense it's already been broken up," said George Wachter, director of old-master paintings for Sotheby's worldwide. "Since one of them is at Yale, it makes the most sense to do it this way," he said of his decision to auction them one by one. Scholars and dealers who have been involved in appraising the watercolors disagree. Martin Butlin, a prominent Blake scholar involved in the authentication process, said that selling them individually at auction was "absolutely philistine." 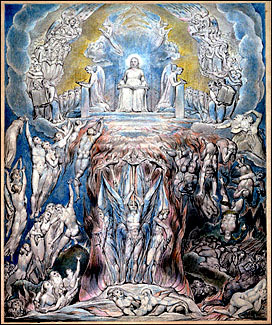 Titles of the watercolors range from "The Reunion of the Soul and the Body" to "The Day of Judgment" to "Death's Door." Richly detailed and occasionally eerie, they are a highly individual interpretation of Blair's Gothic poem, a meditation on mortality and redemption. The poem, part of a poetic genre that came to be known as the graveyard school, proved so popular that by 1798 it had gone through 47 editions. By the time Blake created his illustrations, it was a classic in schools across England. Aside from their significance as works of art — created in the same period that Blake was printing and reprinting his own "Songs of Innocence and of Experience," now part of the literary canon — the watercolors represent a painful episode in the artist's career. 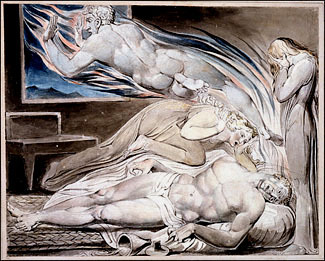 In September 1805, the publisher Robert H. Cromek commissioned Blake to make 40 drawings illustrating "The Grave." He told the artist he would pay him 20 guineas for his work and select 20 for the final publication. 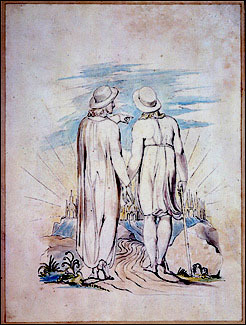 Although Cromek was impressed by Blake's watercolors, he felt that the artist's style of engraving was not commercial enough. So he hired a well-known Italian engraver, Luigi Schiavonetti, to make 12 engravings based on Blake's designs. The decision was a slap in the face for the artist. 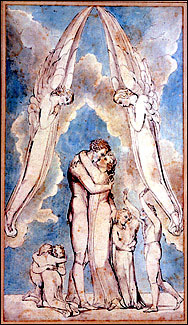 Blake completed the 20 watercolors and delivered them to Cromek, whose widow inherited them after his death in 1812. No one heard about them again until 1836, when they were included in an auction in Edinburgh and described as "A Volume of Drawings by Blake." They were bought anonymously for a mere £1.25 and disappeared from sight. At some point — scholars don't know exactly when — the watercolors came into the possession of the Stannards, a family of artists and art lovers in Bedfordshire, England. Unaware of their potential value, descendants of the Stannards found them while clearing out the house of a deceased relative and took them along with piles of books to Caledonia Books, a shop in Glasgow that specializes in children's books and secondhand academic works. It was there that they were discovered in 2001 by Paul Williams and Jeffrey Bates, two booksellers from Yorkshire. They thought the works looked important but were not certain. They took the portfolio to Dominic Winter, a book-auctioneer concern in Gloucestershire, which then showed them to Robin Hamlyn, a Tate curator, and to Mr. Butlin, the Blake scholar. While Mr. Butlin and Mr. Hamlyn were familiar with 12 of the images because they had been turned into engravings, it was the other 7 — utterly new to them — that excited them. 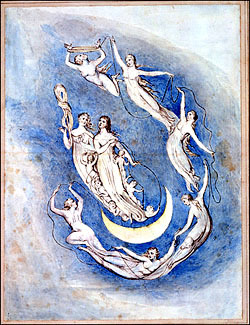 "They're among his best watercolors and are very imaginative," Mr. Butlin said, citing "The Grave Personified," a frontal image of a winged figure with outstretched arms, or "Our Time is fix'd; and all our Days are number'd," a depiction of eight airborne figures accompanied by six cherubs above a crescent moon, together grasping the thread of life. The Yorkshire booksellers decided to have Dominic Winter auction the watercolors in June 2002. At the same time, they approached the Tate to see if it might be interested in buying them. The Tate offered the dealers £4.2 million (about $6.2 million) for them, stipulating that it would have to raise the money. The institution was given five months to do so. As word of the discovery spread, Caledonia Books realized that it had parted with a valuable treasure. It sued the Yorkshire booksellers, contending that Mr. Williams and Mr. Bates had taken the watercolors on approval, a common practice in the art world, and that Caledonia Books remained the rightful owner. The lawsuit sought the return of the watercolors in addition to £15,000 (about $22,000) in damages. With a lawsuit looming, Dominic Winter canceled the auction. Meanwhile, the Tate kept trying to raise the money to buy the Blakes. The parties settled out of court in November 2002, agreeing to sell the watercolors and split the proceeds. That's when Libby Howie, a London art dealer, stepped in. "From the moment I saw them, I was completely obsessed," she said. "In British drawings you never get these kinds of discoveries." Ms. Howie said she bought them from the booksellers with the help of a group of investors for whom she has "a responsibility to get the best price." Sir Nicholas, the Tate director, said he believed that Ms. Howie had paid £4.9 million ($7.7 million) for them. "She simply snuck in and bought them," he said. At the time, he added, it was his understanding that she was buying them for a private collector who wished to take them abroad. "It is disappointing to learn she acted for herself and her investors," he said. Twice Ms. Howie applied for an export license, but the British government withheld approval to give the Tate time to find the necessary funds. But over time, that became more and more difficult. Ms. Howie and her investors had raised their offer to £8.8 million ($13.9 million), more than twice the £4.2 million ($6.6 million) the Tate had originally agreed upon with the Yorkshire booksellers. After the Tate finally said it was unable to raise the money, an export license was granted in September. Ms. Howie said she had spent 18 months looking for a museum that might be interested in buying them, including the Yale Center for British Art, since it already owns one from the original group. She said she had concluded that no museum would be interested in buying the set. Because there are serious Blake collectors in New York and Los Angeles, Ms. Howie said, she finally decided to send the works to Sotheby's in New York. "One would always be happier to see them together," Ms. Howie said. "But in the end I think it's best to let people choose what they most like." A passionate crowd of drawings dealers and collectors gathered at Sotheby's in Manhattan yesterday morning to watch as 19 macabre Romantic watercolors, created in 1805 by the poet and artist William Blake, were auctioned off one by one. The works, illustrations for "The Grave," a 1743 poem by the Scottish writer Robert Blair, were discovered five years ago by two British booksellers. 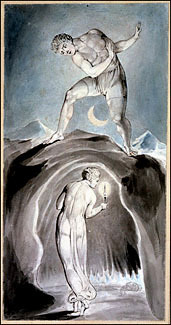 At the time, experts heralded them as the most important Blake discovery in a century and said the illustrations should stay together. It appeared that the public agreed; some in the audience spoke of the breakup of the collection as a criminal procedure. Twelve of the 19 works sold, but many for far less than Sotheby's had predicted. The sale totaled $7.1 million, far below its estimate of $12 million to $17.5 million. 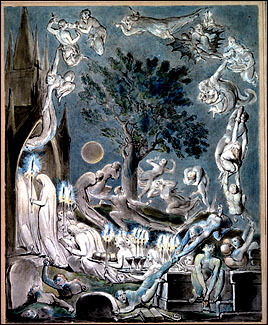 The price was also considerably less than the $16.4 million at which the watercolors had been valued by the Reviewing Committee on the Export of Works of Art in London when Tate Britain, one of the world's most important repositories of Blake's works, tried but failed to raise the necessary money to buy them in 2002. When Sir Nicholas Serota, director of the Tate, heard about the sale's outcome, he released a statement saying, "It is heartbreaking that this exceptional group of watercolor illustrations should be broken up, especially as the sums realized are significantly lower than the auction house estimate from Sotheby's and the vendor." The most expensive work in Sotheby's sale — "Death of the Strong Wicked Man" — was bought by Friends of the Louvre in Paris on behalf of the museum for $1.5 million, right at its high estimate. The seller was Libby Howie, a London dealer, who had bought them from the London booksellers with the aid of a group of investors. She reportedly paid $7.7 million for the 19. The illustrations — watercolors depicting angels, sarcophagi, moonlit graveyards and spirits with their arms linked — were still in their red leather case, which was also up for sale yesterday. John Windle, a rare-book dealer from San Francisco, bought it for $5,040. Mr. Windle also bought "Heaven's Portals Wide Expand to Let Him In," an illustration of Jesus standing in a Gothic doorway, for $329,600, under its $350,00 low estimate. "We knew it was a lot of Blakes," said Nancy Bialler, an expert on prints and drawings in Sotheby's old master department. "But I thought because of their sheer beauty and importance that the market would rise to the occasion." to the dustbin of ART!!! Here we do NOT discriminate. There are no sacred cows. High and low beware! Our CARAMEL statuette is derived from the traditional cagané figure or 'shitter' from the northeastern Spanish region of Cataluña where no manger scene can be found without one. It's attributes are far more pedestrian here. 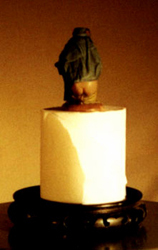 Chef d'Atelier, RODIN S. COANE. "THE BLACK PAINTINGS OF GOYA"
"Are They Goya's "Black" Paintings?? - Yes"
Oh! Celia, Celia, Celia shits!" content and do not necessarily reflect the opinions or views of the other participants in www.Atelier-RC.com or of the members of L'Atelier.